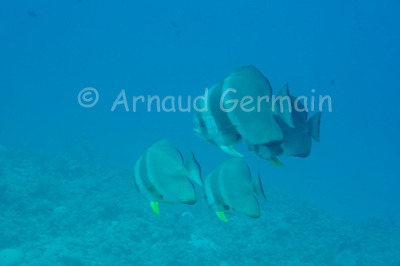 On a guided dive near Sharm El Sheikh, we came about this school of Longfin Batfish swimming in open water near a coral pillar. There were about 10 of them swimming about. They are quite shy fish and I had to try different approaches to get close enough to them in order to take meaningful pictures. Nikon D700, Nikon 28-105 mm macro at 66mm, F8, 1/60th, ISO 400, Ikelite Housing and Ikelite DS160 strobe set on TTL. Temple, about 20 metres down, Sharm El Sheikh, Egypt.